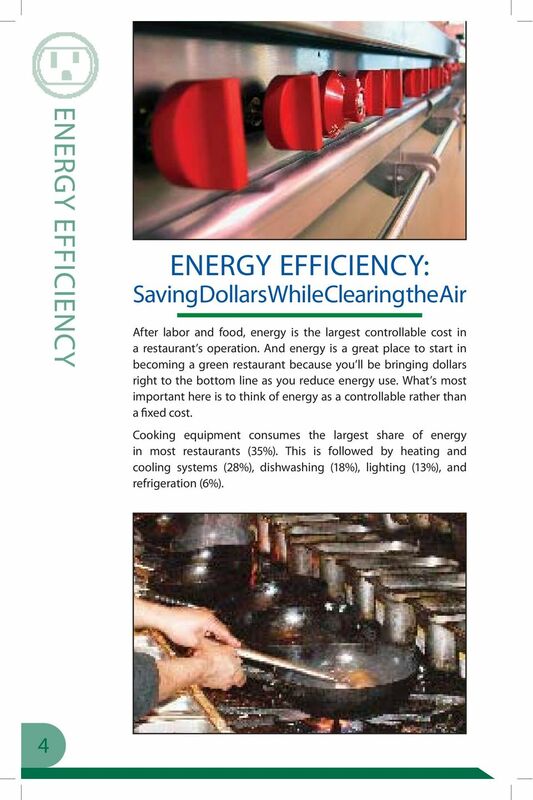 Download "ENERGY EFFICIENCY ENERGY EFFICIENCY: Saving Dollars While Clearing the Air"
3 6 Buy the Right Size: Evaluate the capacity of the equipment you are buying. By buying the unit that s just big enough for your anticipated volume, you ll save both in up-front and ongoing energy costs. 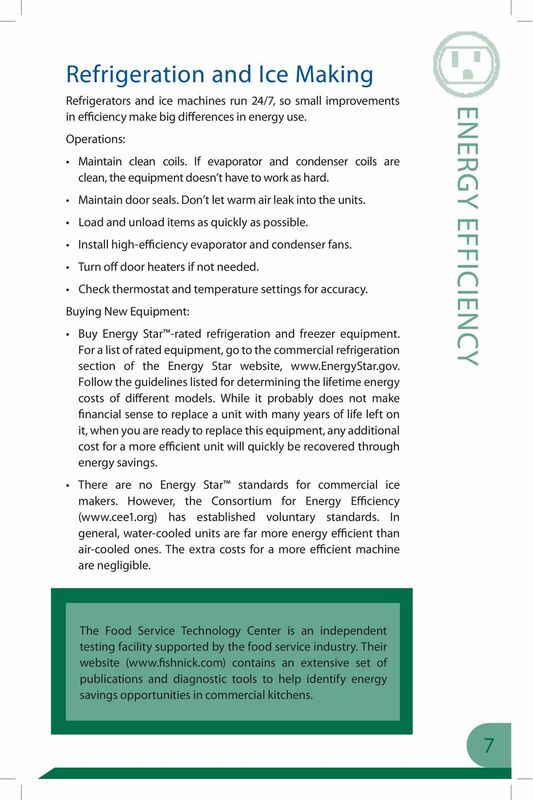 Try New Technologies: As an example, convection ovens use far less energy than conventional gas ovens. Dishwashers Dishwashing uses large amounts of both hot water and electricity. Energy and water use can be reduced through both operating practices and new, more efficient equipment: Operations: Install low-flow valves on pre-rinse sprayers. These valves, available for just a few dollars, reduce water use on pre-rinse sprayers by 50% and could save hundreds per year in both water heating and water costs. Run full loads. The same amount of energy is required whether a load contains one plate or 100. Turn down the temperature. Make sure that you re not heating water beyond the point required by sanitation codes. New sanitizer products may allow you to reduce water temperature. 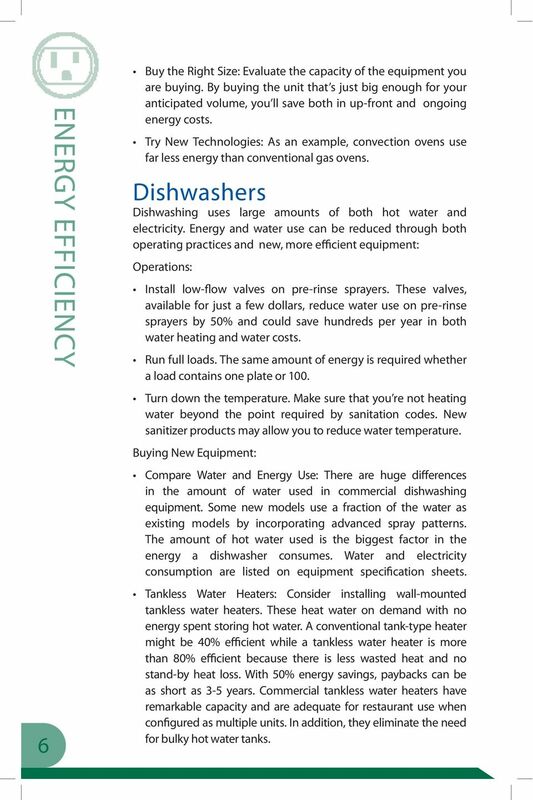 Buying New Equipment: Compare Water and Energy Use: There are huge differences in the amount of water used in commercial dishwashing equipment. Some new models use a fraction of the water as existing models by incorporating advanced spray patterns. The amount of hot water used is the biggest factor in the energy a dishwasher consumes. 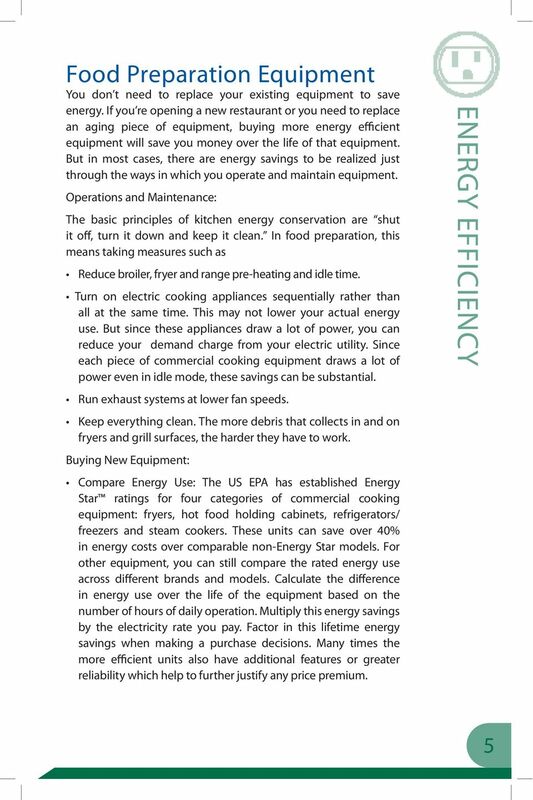 Water and electricity consumption are listed on equipment specification sheets. Tankless Water Heaters: Consider installing wall-mounted tankless water heaters. These heat water on demand with no energy spent storing hot water. A conventional tank-type heater might be 40% efficient while a tankless water heater is more than 80% efficient because there is less wasted heat and no stand-by heat loss. 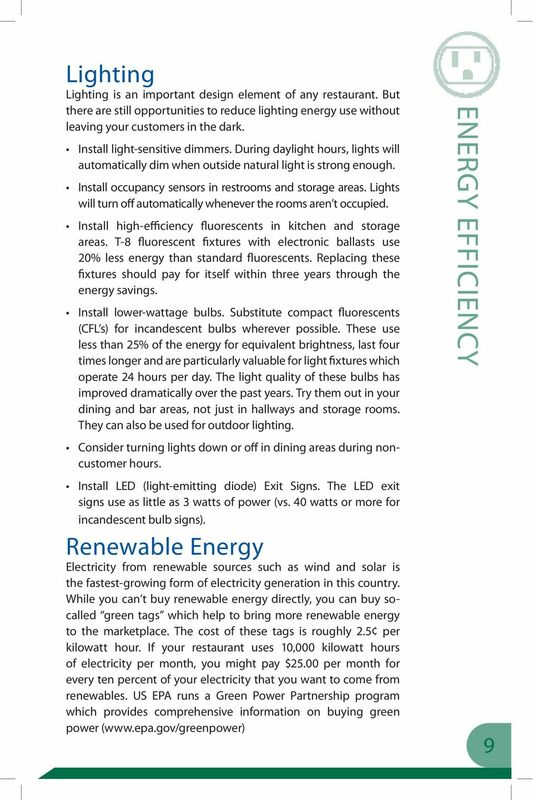 With 50% energy savings, paybacks can be as short as 3-5 years. Commercial tankless water heaters have remarkable capacity and are adequate for restaurant use when configured as multiple units. In addition, they eliminate the need for bulky hot water tanks. 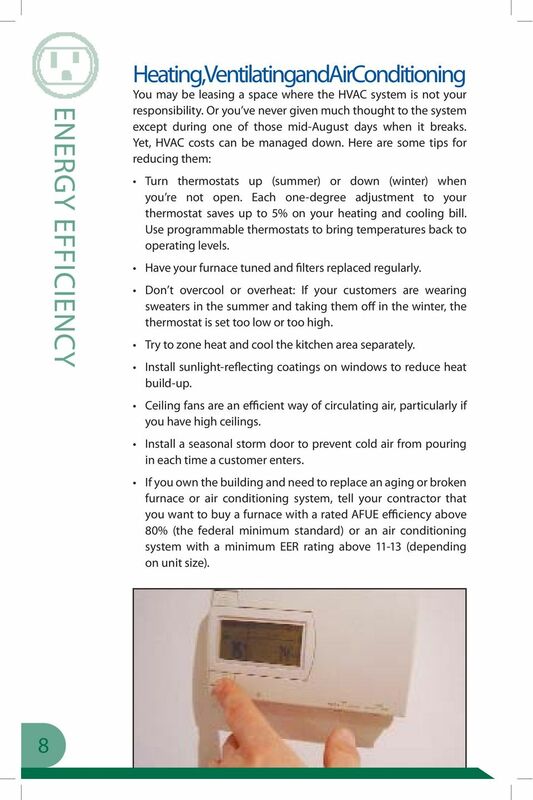 Energy Efficiency Workshops For Commercial Customers Takeaways Energy is a business issue Energy improvements are an investment Save energy because you can Enjoy the next hour- this really isn t work!